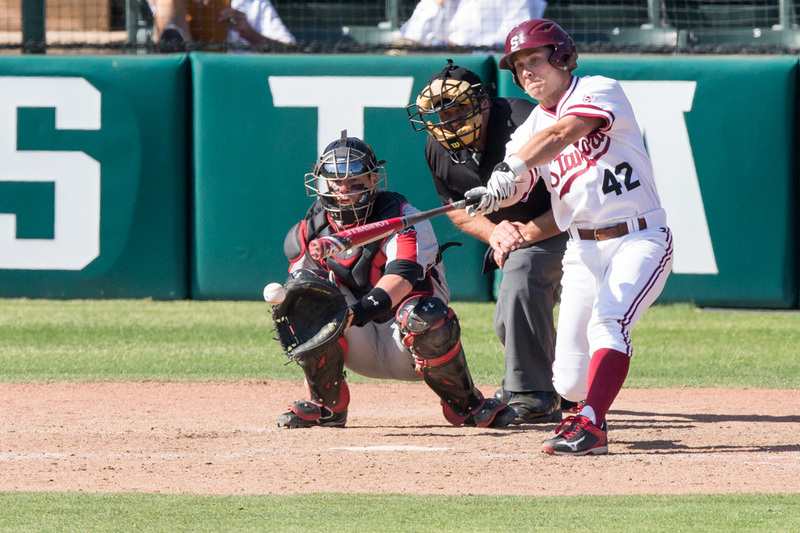 As the baseball player with the team’s highest batting average this season, senior Luke Pappas divulged to The Stanford Daily that he has two girlfriends: school and baseball. The Stanford Daily’s Elizabeth Trinh sat down with Pappas to discuss his time on the Farm, his role on the team and his future plans after he graduates. 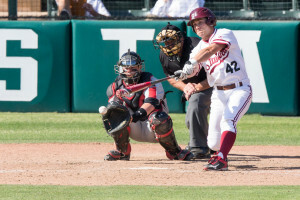 The Stanford Daily (TSD): Several guys on the team have described you as the most serious player on the team. Would you agree with that? TSD: In high school, you played football, basketball and baseball. Why did you decide to pursue baseball? LP: If you look at me — in football, I played quarterback — and to compete at a Division I college like Stanford, I don’t really have the body type for that. Obviously, I realized that. Football I actually had the most fun playing, but I wasn’t cut out for it at the next level. Basketball was the same deal. I had fun playing in high school, but they weren’t necessarily sports that I wanted to compete at at the next level. With baseball, I wasn’t actually recruited. I was a walk-on, but the sport has always been in my blood. I grew up with it. My dad taught me the game when I was in Little League, and he played for four years in college and professionally for a few years. So it’s always been a sport that’s been a big part of our family, and so I called up Coach Marquess. Coach gave me a chance during my freshman year to go out and try out for the team. I was fortunate to get one spot out of the 35, so things worked out at the end of the previous fall season for that to happen. So I just took that and ran with it. Ups and downs, no questions for the last four years, but it’s been a memorable experience, and one that I am happy that I’ve been through. TSD: What has been your favorite baseball memory on the Farm? LP: There are a few. I mean, obviously, you’re going to think back and remember the guys who you played with. They were a good group of guys, and a lot of them left last year in the [MLB] Draft as juniors, but playing with those guys for three years. And there are three other seniors with me — David [Schmidt], John [Hochstatter] and Jordan [Kutzer] — and we’ve been together for four years. Thinking back to last year, that was the last time all of our class was together, and we’ve had some ups and downs. We started the season off kind of rough, but we put it together toward the end. We kind of squeaked in into the postseason and got into the [NCAA Regional] Tournament as a three-seed against Indiana, and we won that. I think Tommy hit a walk-off or hit a home run late, and we won the Indiana Regional. We made it to Vanderbilt and lost to them, who were eventually the College World Series champions last year. Obviously, you want to win every game and go out on top, but to make that run at the end of the season was fun. It was a great memory. And then, last year also, Coach [Marquess] won — I think it was his 1500th game at Cal. Any time you’re part of a milestone like that, it’s going to be memorable. Those are two that stick out. And third, Coach called me in my freshman year. Initially, Coach called me and a couple other players and said, “we had a heck of a season in the fall, and there are 35 guys that we get to keep, and at this point and time, we can’t keep you this year.” He actually told me that the day before, and I’m in class the next morning, a 9 a.m. class, and I see my phone as I walk out. It was 10 o’clock, and I see a voicemail from Coach [Marquess], and he says, “Call me as soon as you can.” So I call him up, and then a player had decided that he was going to do other things, and a spot opened up. He said, “that spot is yours,” and that’s another memory that sticks out. Those three are probably the three highlights. TSD: What is your proudest achievement at Stanford? LP: One is making the team as a walk-on, because it was a challenge, and it’s something I was proud of. And then two, academically, it’s so rare to go to a school like this. I wouldn’t say that grades quantify what you have, but it’s the knowledge that you accumulate over your four years, or however long you spend. To have that opportunity to capitalize on is one thing, but to take advantage of it to the fullest is another. Looking back, you never want to say, what if I had done this or that. At this point, I’m not finished yet, but I am proud of the effort that I put in, and I am ready for whatever the next steps are. TSD: As a senior, what are your next steps? LP: It’s sad to say, but we have a three-game set against Washington State, and it’ll probably be the last three games that I compete in competitively at the highest competitive level. It’s the end of the line for me, but after graduation, I’ll start orientation. I’ll be joining Morgan Stanley Technology Investment Banking Firm in Menlo Park. I’ll be working with technology companies in Silicon Valley and around the world, helping them navigate their finances. It’ll be an analyst role. Another thing I am actually working on with two other athletes — two gymnasts — is a website for high school athletes and recruiting, so that’s one thing. A third thing, and we actually launched it yesterday, I don’t want to say too much about it yet, but it’s going to be an application that facilitates the management of classes. Those three topics will be where I focus my attention after graduation. TSD: Tell me about computer science — I hear you have above a 4.0 GPA. LP: We can just cap it at that. [laughing] It’s kind of a running joke on the team. Coach is always joking with me and asking me how many A+’s I have. Honestly, I know now, but I never did keep track. One day, he made me go and count, but guys are always asking me what my GPA is, because it is published in the papers. I always say, guys, I haven’t graduated yet, but when I do, I’ll let you know. Until that point, I don’t want to say anything. I don’t think anyone knows what the exact number is. The point is, having a high GPA is great because it opens doors in terms of employment and different things, but you never want to get wrapped up in letter grades and numbers. Sure, it shows that you did well on tests, but the bottom line is that you come to school not to get a grade but to get an education. For me, it’s never been all about the letter grade or the GPA, but more of, am I getting out of this class what I need to get out of it, and am I putting in the effort for what is required to get out of the class? As long as I am doing that, you can be content with the effort you’re putting in, and the grade is whatever it is. I’m good to be in this position now as a senior, but it’s not about the grade point average. It’s about what you do with that education as you do bigger and better things. That, I think, is the underlying message. TSD: Do you have any superstitions? LP: You know, it changes. It’s really about what works for you, and you don’t change it until it stops working and you get a new superstition. With baseball, I don’t have many. I always have my hat backwards when I catch, and some guys think it’s a superstition, but I do it because it’s comfortable. My mask doesn’t quite fit my head, so I need a little more surface area for my mask to fit. I honestly don’t really have superstitions. TSD: I hear you pride yourself in doing push-ups, but you didn’t win a baseball team push-up competition. LP: [laughing] Luke Asperger likes to claim that he did beat me, and he did beat me by two. I went first, and I thought for sure that nobody would get close to what I had. Sure enough, Luke comes out of nowhere and knocks out two more than I did. So something that I’ve done since the end of high school and through Stanford, whenever I feel like I [have] to knock out a set [of push-ups and sit-ups], whether it’s during batting practice or in the weight room or sometimes during games, the majority of my time — and I didn’t start any games, but after I would come in late to pinch hit — but just to stay warm and to stay ready, I always like to do a set every inning just to say ready. I guess that’s a superstition, but it’s something to keep my body ready in case a chance to get into a game pops up. TSD: I have been told that you work on the shed. Tell me about that. LP: One of the things that Coach Marquess takes pride in and that the players take pride in is that we play on the field — it’s our responsibility to make sure it looks nice and take care of it. It’s one of the things that we do as a program, and each player has a different role. Catchers clean up around home plate, and pitchers take care of the mound. To do all those jobs, you need tools, and they all go in the shed. My job as a freshman was to maintain the shed: to make sure the tools go back as they come out. Growing up, my dad was involved in construction, so he and I would do construction jobs, and landscaping is somewhat similar to construction. When I worked with my dad, I did my job and put my tools away and made sure everything around it looked good. That’s how I approached the shed. I don’t know who worked on the shed before me, but I like to say that I did it better than anyone else did. It’s not necessarily glamorous, but at the end of the day, it looks good. Actually, I’m training Chris Castellanos and Matt Winaker. They’re the two proteges. They get the shed when I graduate. One more day actually. Tomorrow is the last day of practice, and then they get the shed.